Joining the Four O’Clock Faculty means going that extra mile to be sure that you are improving your own learning and the learning of your students. It also means not resting on your laurels, going above and beyond to continue learning while striving to innovate. This means that as an educator, you have to try. So, how can you continue to try? Start with a simple idea from The Four O’Clock Faculty: A Rogue Guide to Revolutionizing Professional Development. 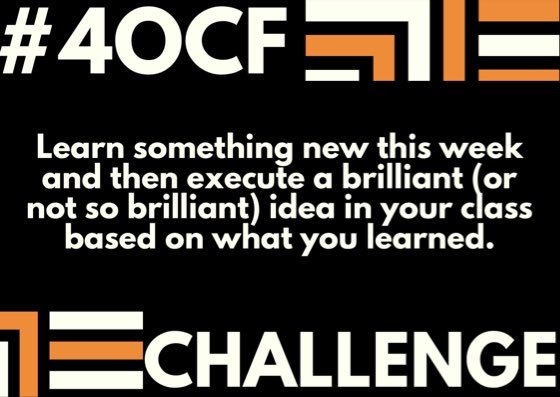 Learn something new this week, and then execute a brilliant (or not so brilliant) idea in your class based on what you learned. Let us know what you learned. Share your brilliant idea. Share how it worked (or didn’t work). If it didn’t work, share what you learned because of the failure. Blog about it. Tweet about it. Learn something new. Execute a new idea based on what you learn. Let the world know how it went.